Is Mitt Romney really a chameleon willing to change his colors endlessly and without shame in his quest to become president? Brendan Nyhan isn’t so sure. He’s been reading recent press coverage of Romney (He’s wearing Gap skinny jeans! In both cases, of course, detractors of Romney or Gore will argue that the candidate really is especially phony or inauthentic. Even if this is true, the problem is that the perception that a politician is phony encourages reporters to manufacture misleading narratives to reinforce that frame (as we saw with Gore in 1999-2000). In reality, almost every politician is calculating in the clothing they wear, the images they present, and the events they stage. Any reporter can deconstruct this stagecraft or write stories about how candidates are reinventing themselves (indeed, this is one of the few sorts of criticism allowed under what NYU’s Jay Rosen calls the view from nowhere). But they tend to only write these stories about candidates for whom the narrative of phoniness seems to apply. For instance, Fred Thompson, the former Tennessee senator who briefly ran for president in 2008, had a homespun manner. As a result, the story that Thompson pretended to drive away from a public event in his signature red pickup truck before transferring to a luxury car got little attention. OK, point taken. But Brendan is right: I would say that Romney is unusually willing to say and do anything to make himself more acceptable to the tea party crowd that now controls the Republican nomination process. It’s not so much his new jeans or his love for NASCAR as it is his all-too-transparent effort to scurry shamelessly to the far right and pretend that he’s anything other than the moderate conservative technocrat that he really is. I suppose Brendan might say that all politicians are calculating in the positions they take during primaries too, and that’s true. 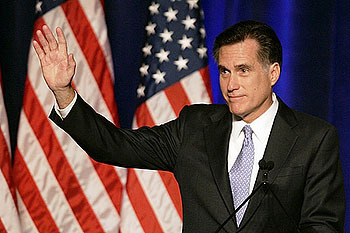 But unless I’m way off base, Romney sure does it a lot more — and a lot more clumsily — than most.